Abstract. East African countries face an increasing threat from poor air quality stemming from rapid urbanization, population growth, and a steep rise in fuel use and motorization rates. With few air quality monitoring systems available, this study provides much needed high temporal resolution data to investigate the concentrations of particulate matter (PM) air pollution in Kenya. Calibrated low-cost optical particle counters (OPCs) were deployed in Kenya in three locations: two in the capital Nairobi and one in a rural location in the outskirts of Nanyuki, which is upwind of Nairobi. The two Nairobi sites consist of an urban background site and a roadside site. The instruments were composed of an AlphaSense OPC-N2 ran with a Raspberry Pi low-cost microcomputer, packaged in a weather-proof box. Measurements were conducted over a 2-month period (February–March 2017) with an intensive study period when all measurements were active at all sites lasting 2 weeks. When collocated, the three OPC-N2 instruments demonstrated good inter-instrument precision with a coefficient of variance of 8.8±2.0% in the fine particle fraction (PM2.5). The low-cost sensors had an absolute PM mass concentration calibration using a collocated gravimetric measurement at the urban background site in Nairobi. 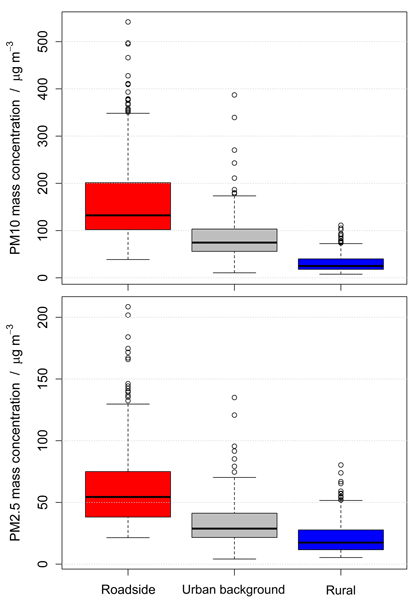 The mean daily PM1 mass concentration measured at the urban roadside, urban background and rural background sites were 23.9, 16.1 and 8.8µgm−3, respectively. The mean daily PM2.5 mass concentration measured at the urban roadside, urban background and rural background sites were 36.6, 24.8 and 13.0µgm−3, respectively. The mean daily PM10 mass concentration measured at the urban roadside, urban background and rural background sites were 93.7, 53.0 and 19.5µgm−3, respectively. The urban measurements in Nairobi showed that PM concentrations regularly exceed WHO guidelines in both the PM10 and PM2.5 size ranges. Following a Lenschow -type approach we can estimate the urban and roadside increments that are applicable to Nairobi (Lenschow et al., 2001). The median urban increment is 33.1µgm−3 and the median roadside increment is 43.3µgm−3 for PM2.5. 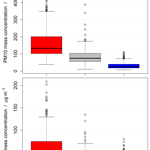 For PM1, the median urban increment is 4.7µgm−3 and the median roadside increment is 12.6µgm−3. These increments highlight the importance of both the urban and roadside increments to urban air pollution in Nairobi. A clear diurnal behaviour in PM mass concentration was observed at both urban sites, which peaks during the morning and evening Nairobi rush hours; this was consistent with the high roadside increment indicating that vehicular traffic is a dominant source of PM in the city, accounting for approximately 48.1%, 47.5% and 57.2% of the total PM loading in the PM10, PM2.5 and PM1 size ranges, respectively. Collocated meteorological measurements at the urban sites were collected, allowing for an understanding of the location of major sources of particulate matter at the two sites. The potential problems of using low-cost sensors for PM measurement without gravimetric calibration available at all sites are discussed. This study shows that calibrated low-cost sensors can be successfully used to measure air pollution in cities like Nairobi. It demonstrates that low-cost sensors could be used to create an affordable and reliable network to monitor air quality in cities. How to cite: Pope, F. D., Gatari, M., Ng'ang'a, D., Poynter, A., and Blake, R.: Airborne particulate matter monitoring in Kenya using calibrated low-cost sensors, Atmos. Chem. Phys., 18, 15403-15418, https://doi.org/10.5194/acp-18-15403-2018, 2018.